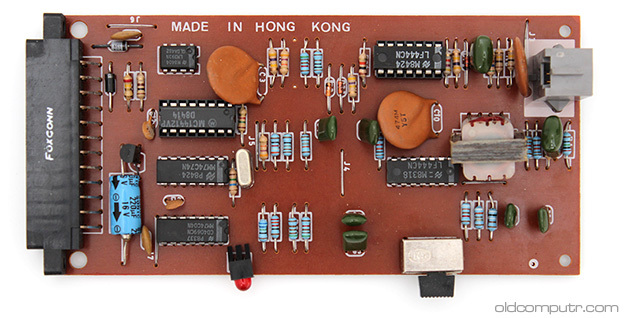 It’s quite impossible to collect all the peripherals that were produced for the Commodore computers, but a few of them are worth searching for because they mark a milestone in the history of home computing. 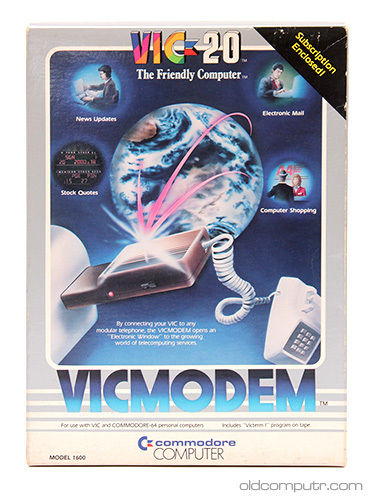 The VICMODEM is one of those peripherals: it’s been the first modem to cost under 100$ and the first to sold over a million units, contributing to the diffusion of online services and BBSes outside laboratories, universities, big Companies and military agencies. I was searching the net for the exact marketing year, I was in doubt between 1981 and 1982. The precise answer was right under my nose: the manual itself tells the genesis of the product. 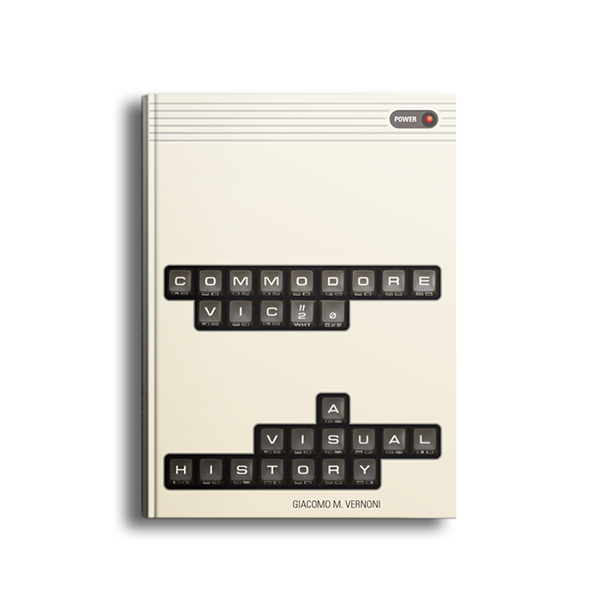 When Commodore introduced VIC 20™ — the Friendly Computer, the first color computer priced under $300, we wanted to include a telephone modem to go with it, but we wanted our modem to be in the $100 range, so everyone could afford telecomputing. Unfortunately none of the major modem manufacturers we contacted would, or could, make a modem we could sell at this price. Finally we located a small creative design group and presented them with our concept and design specifications. The group started working with us and a few months later delivered the modem we asked for. 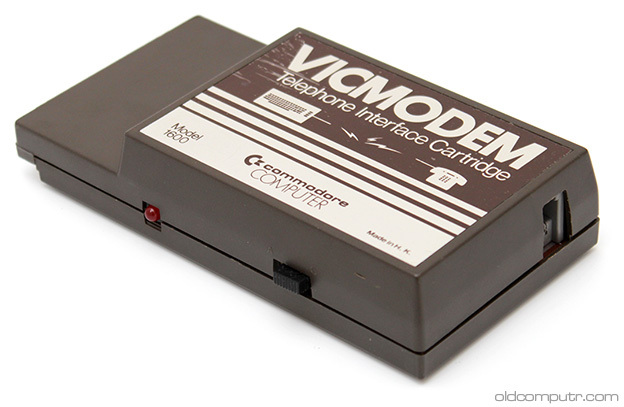 It took a total of 6 months from concept to production and in March 1982 the first VICMODEMs were delivered for sale. Much of the credit for the project goes to Michael Tomczyk, who also created the Commodore Information Network to decrease the workload of the customer service department of the company. In 1982 the section with the most traffic on Compuserve was the Commodore network. The box is bigger than it seems from the picture: its dimensions are about those of a ream of US letter paper. The contents of the box surely changed during the years; the one I got has software on floppy and mentions the Commodore 128, so it must be marketed during 1985. 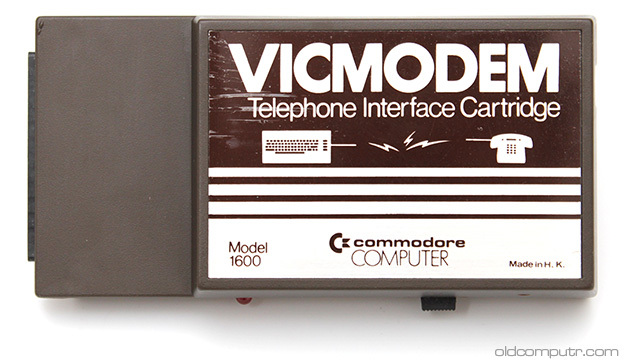 The modem connects to the user port of the Commodore VIC 20/64/128; on one side there’s a switch to choose if the computer answers the call (A) or originates it (O). On the back there’s the plug for the cable that usually is connected to the phone handset – the modem couldn’t directly dial the number, so you had to dial it on the phone and then connect the modem in place of the handset. The bottom and the top of the case are kept together without any screw. For further reading I suggest the post on the Denial wiki and a short review of the VICMODEM on the 1983 September issue of Compute! Gazette. We all have that futuristic device in our pockets, don’t we? In 1980-81, the cheapest modem available cost US$400 and most were acoustic modems that involved putting the handset in a cradle which was bulky and expensive. I had seen a few direct connect modems but they cost US$600 or more. In 1981 I wanted to provide our Commodore user community with a way to communicate using CompuServe which was a pre-Internet telephone based user network. One of the nice features of the VIC-20 was a built-in RS232 interface which was essentially a telephone connector. Our engineers at Commodore were too busy to work on this for me, so I contracted an outside company that made industrial modems used in warehouses and asked them to work on this. My main requirement was that it had to COST under US$33 so I could price it at retail for $99 (3 x $33 was the formula I used to set the retail price). The engineers struggled with an acoustic design and couldn’t get the cost under $50 so one night at the Consumer Electronics Show in Las Vegas I returned after midnight to my hotel room, to find the engineers waiting in the hallway outside my room. They showed me their design on a yellow notepad and apologized that they couldn’t meet my cost target. I stared at the design for a moment, then said, “We have a built-in RS232 Interface which means we can connect the telephone cord directly to the computer, right?” Then I drew a picture of a cartridge with the cord and said, “You design the cartridge, we’ll manufacture it and pay you a royalty.” The engineers whooped with excitement at the idea and confirmed that this was do-able. 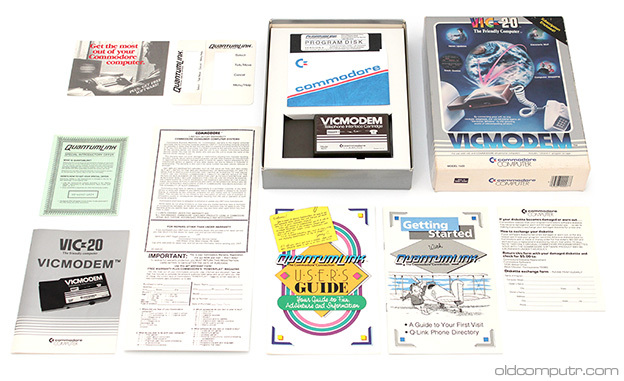 The result was the Commodore VICModem, the first modem priced under $100 and the first modem to sell one million units. This also allowed me to negotiate and bundle $200 worth of telecomputing services (CompuServe, the Source and Dow Jones) with the modem – and being on CompuServe allowed me to develop a telephone based user community called the Commodore Information Network – an early precursor to online communities we take for granted today. The Commodore Information Network quickly became the largest user community on CompuServe. In those days, sites like CompuServe (and AOL) paid content providers like Commodore for user traffic – our first check was for $36,000! – this is interesting trivia because this is the REVERSE of how payments were made just a few years later when networks required content providers to pay them a fee. The Commodore Information Network also allowed users to answer technical questions from new and existing Commodore owners – which was important to us because we only had half a dozen college interns in our customer service group (which I established) to answer customer inquiries by phone. It was impossible for 6 people to respond to questions from a million VIC20 owners, so the information network on CompuServe was vital to our business strategy and customer relations. All of our customer service interns came from Drexel University in Philadelphia. 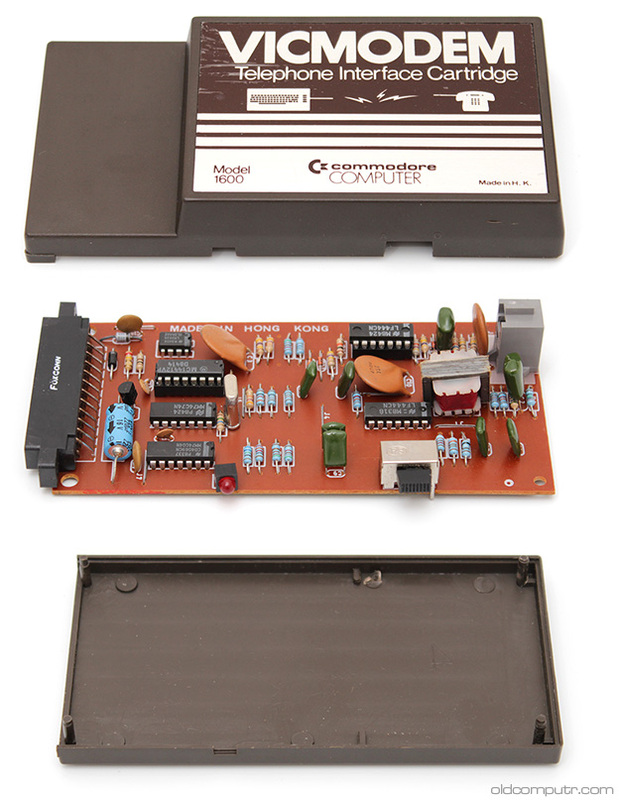 Next to the VIC-20, the VICModem is the technical achievement I’m most proud of. Today, all of these functions and more – camera, video, GPS, etc. – are built into our smartphones, which are enabled by innovations in nanotechnology. This month (December 2014), my new book – NANOINNOVATION: What Every Manager Needs to Know – was published by Wiley’s scientific division (which is based in Germany). I wrote this book to show what’s really happening in nanotechnology innovation, and to do this I interviewed more than 150 nano pioneers and insiders from more than 30 different countries. If anyone has an interest in nanotechnology, check out the book and if you read it, let me know your opinions!